“YAS KWEEN”: It’s so much more than a slogan or phrase. It’s a way of life – a state of mind encouraging you to be the youest you there is, to feel uninhibited by friends and family, society and judgments. Like hakuna matata before it, YAS KWEEN is a problem-free philosophy: A warm, whole-hearted embrace of the multifaceted self. True to its name, Big Hair Girls’ new single “Yas Kween” is an empowering celebration filled with good feeling and positive energy, an invitation for us to dance, laugh, love, and show off our true colors. Atwood Magazine is proud to be premiering “Yas Kween,” the sophomore single from Jersey City’s Big Hair Girls. The duo of sisters Lizzy Lightyear and Venus (with producer/multi-instrumentalist Donny Dykowsky), Big Hair Girls offer just the right indulgence of power pop with a dash of self-awareness. 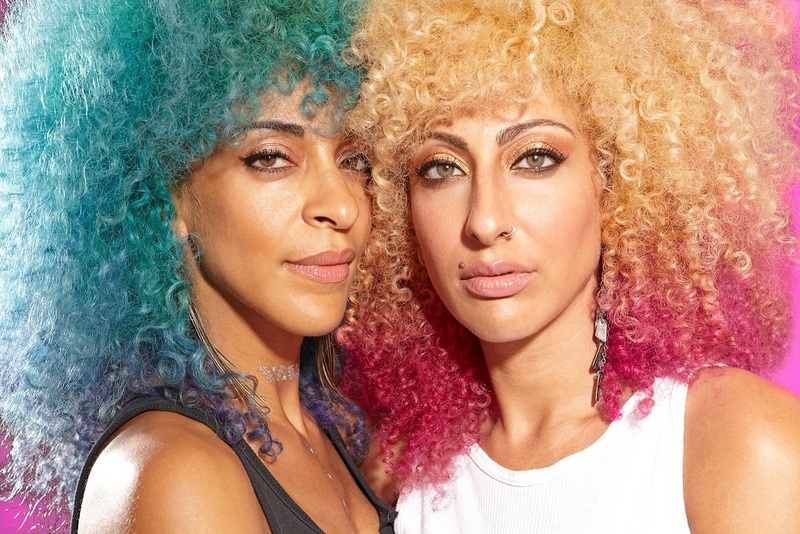 The Russian/Romanian/Surinamese/Caribbean sisters exude self-confidence and determination on their independently-released second single, a dance-pop anthem that has all the necessary ingredients for a euphoric visual and listening experience. Not all of us have strong role models; not all of us grow up with others believing in us; not all of us grow up believing in ourselves. That’s what truly makes songs like “Yas Kween” so powerful: They have real impact. Big Hair Girls sing, “my mama told me I can go far – every girl is born a star,” and we can hear the conviction in their voice, feel its resonance soaking into our skin. Self-confidence is infectious; combine that message with the song’s catchy beat, and there’s no telling what it can do – the difference it can make. “We were inspired to write the song ‘Yas Kween’ by two of our favorite things: Gay culture and the show Broad City,” the duo explains. “It’s such a positive phrase — you use it when you’re celebrating or empowering someone — we use it all the time and we thought it would make a great hook for a song.” We can all visualize Broad City‘s Ilana Wexler belting out Big Hair Girls’ emphatic chorus in our heads. That’s the kind of unadulterated, exuberant cheer these words spread – but we don’t have to rely on television or music to give us that energy. We have the ability to own our happiness – wear our pride like a badge of honor. Already a musical bash, “Yas Kween” gets the perfect visual accompaniment thanks to Big Hair Girls’ Cidney Hue-directed music video. The Lightyear sisters bask in the sun at a pool party, while generations come together to play, blow bubbles, and play with hula hoops. Later on, the duo drives up in a local ice cream truck – ice cream, another timeless symbol of happiness – and everyone gets a cone. It’s all fun and loving, from the morning to the evening’s dance party. From Jersey City to your headphones and beyond, Big Hair Girls’ “Yas Kween” spreads a message of undeniable worth. It’s more than a fun day in the hot summer sun: It’s an anthem of self-love and positivity, a reminder that you are special, you are loved, and you are unique. Own it, and do you!